Not only will viewers of John Wick be pleased with the action, though the movie does contain lots of vulgarity, they will also discover plenty of leadership lessons in John Wick. That’s what we’re going to be covering in today’s Reel Leadership article. We’ll examine some scenes from the Keanu Reeves movie to see what leadership lessons you can extrapolate. Then we’ll see how they can relate to you and your leadership. John Wick opens with an injured John Wick. He stumbles out of a black SUV and falls to the ground. There, he opens his cell phone and views a video of his deceased wife, Helen (Bridget Moynahan). While you may not be sure exactly what was happening at the beginning of John Wick, you know the opening scene had to do with a loved one. This person turned out to be John’s wife who passed away after a battle with cancer. John was viewing this video to remind himself of the good times. It was also to remind him of why he had hunted down the bad guys. They’d killed the one thing his wife had left for him, his puppy. As you lead, you cannot forget why you lead. Your why should be the driving force behind everything you do. It directs your way and gives you the motivation to keep going when times are tough. Keep reminders of your why. View them regularly. Make sure you’re putting your why at the front and center of what you do. Just checking up on an old friend. Marcus showed up at the funeral of Helen. When John ran into him, he confronted Marcus and asked him why he was there. He admitted he wanted to pay his respects and check up on his friend. John may not have seen Marcus for some time, yet Marcus still considered him a friend. He did what friends do. He checked up on a friend who was hurting. Leading can easily distract you from those you care about the most. Your family and friends may be neglected because of your duties to lead a team. However, you can’t let your position stop you from checking in and caring for those you love and consider friends. Don’t be a leader who is absent from the lives of those you claim to care about. You have to be there for your friends. Check in on them when they’re hurting. Show them you are present and available in their lives. Iosef Tarasov (Alfie Allen) was the son of Russian gangster Viggo Tarasov (Michael Nyqvist). He was also interested in John Wick’s 1969 Ford Mustang. When he ran into John Wick at a gas station, he asked John how much to buy the car. John responded the car was not for sale. This infuriated Iosef and he sputtered out “Everything has a price, #&$^@” in Russian. What Iosef didn’t realize was that John could understand Russian. John’s response shocked Iosef. You may believe you speak a different language than those you lead. You may even believe those you lead could never understand what you’re saying to other leaders. Don’t be shocked when your people understand exactly what you’re saying. They’re not dumb. They catch onto what is going on in the business and begin to understand the language. After killing John Wick’s dog and stealing his Ford Mustang, Iosef brings the car to Aurelio (John Leguizamo) and his chop shop. Iosef asked Aurelio to deal with the car. However, Aurelio refused to because he realized the car belonged to John Wick. Iosef gets his dad involved. Viggo calls Aurelio and asked about the way he treated Iosef. Aurelio laid out the facts to Viggo. He let Viggo know his son had stolen John Wick’s car and killed his Beagle puppy. This changed Viggo’s outlook on how his son was treated. Then and there, he knew his son deserved the treatment he received. You may have heard one side of the story and quickly jumped on the bandwagon of the person who told the story. Yet, there is another story to be told. The story of the other person involved. Be careful in jumping to quick conclusions. They’re often wrong… Or at least one-sided. Get the facts from all parties involved. Seek out the truth. Ask questions and see what really happened. Viggo sends Russian thugs to dispatch John Wick. The thugs arrive at John’s home only to find a rude awakening. John is there waiting for them. John Wick uses the skills he’d honed as an assassin to take out his home invaders. He uses his skills with a gun and his hand-to-hand combat training to kill the thugs. Your skills probably don’t involve hand-to-hand combat or gun accuracy. Your skills are more along the lines of influencing people to do their jobs or increasing the bottom lines. These are great skills to have. They’re also skills you can constantly hone. Work on improving your skills. Take classes, go to conferences, purchase online courses. Whatever you do, never stop honing your skills. After killing the home invaders, John called Charlie’s (David Patrick Kelly) cleaning crew. He asked Charlie for a dinner reservation for 12. This was code for 12 bodies needed to be disposed of. Do you know the language of the business you’re working in? You need to if you desire to be successful. Great leaders know how to use the language of other leaders. They communicate with words only other leaders will understand and communicate with. Learn the language. Then speak the language. Have you thought this through? I mean, chewed down to the bone? You got out once. You dip so much as a pinky back into this pond… you may well find something reaches out… and drags you back into its depths. John Wick was a former assassin. He’d barely gotten out of the assassin business before. By going after Iosef, he was going to pull himself back into the business. Winston was the “manager” of the Continental Hotel, a safe place for assassins. Winston knew that if John went after Iosef, he would be considered in business again. Leaders have to think through what they do. Especially when considering a return to the leadership arena. Being a leader has a way of dragging you back in when you get close to a situation where you think you can be of help. This reminded me of how Pam and I got back into youth ministry. We’d exited our previous church and left the ministry. We stayed out for a year or so before being approached at the possibility of returning as youth leaders. Guess what happened? We were sucked back in. This happens a lot. Leaders have a desire to lead… Even after being burned out. 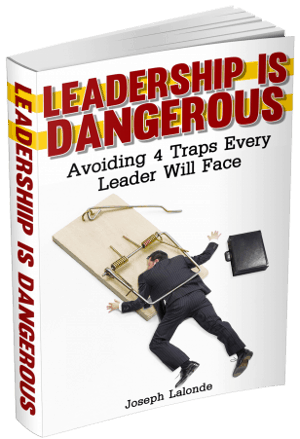 Know if you dabble your toe in the leadership arena again, you may be pulled back in. John Wick was a scary dude. He had been given the nickname of Baba Yaga (or the Boogeyman). Yet, Iosef didn’t fear John. He believed the stories about John had been exaggerated. He needn’t be scared. John could be easily dispatched. Iosef discovered otherwise. John Wick wasn’t an easy mark. John was a very dangerous man. And Iosef was a fool to not be scared. You may believe you know everything you need to or that there are not scary parts to leadership. You’d be wrong if you believe this. And there are other things that should scare leaders as well. You’ll discover them along your journey. Iosef was the first person to utter these words in John Wick. John repeated these words back to Iosef when he let him know Victor (Toby Leonard Moore) had been killed. Iosef’s action had a price. Victor died. Iosef’s soldiers died. And, Iosef died in the end. His actions carried a very heavy price. Are you counting the cost of what you’re doing as a leader? Do you know the price of your actions? You need to know every action you take as a leader has a price. Sometimes, the price is heavy. Be ready to pay the price. Viggo and John Wick were similar but vastly different. Yet they could still find common ground. Their common ground was that the lives they’ve lived brought them nothing but trouble. There was death, heartache, and pain all around them. If you believe there’s no common ground to be had, remember the common ground Viggo and John discovered. Their lives were more alike than they were different. You will find this with other leaders and those you lead. Your lives are much more similar than you tend to believe. Be willing to find the common ground and agree on something. Towards the end of John Wick, Viggo and John start to fight. Viggo asked John to put away the weapons. He wanted them to fight like men, fist to fist. John agreed. He tossed his gun to the side and began to pummel Viggo. Viggo makes the fight unfair when he pulls out a knife and stabs John. Your team is looking to you to play by the rules. As a leader, you will lay out a plan for how things should go. You’ll give them the dos and don’ts of what you expect. When you switch up the rules, you begin to be unfair to your team. By telling them one thing and then switching to another, you begin to confuse your team. This is unfair to them. They’re there to support you. Don’t be unfair. After Viggo pulled out the knife, he and John continued to fight. Then John did something strange. He allowed himself to be stabbed by Viggo. While this hurt John, this also allowed him an advantage. Being stabbed brought Viggo close to John. This closeness allowed John to break Viggo’s arm and win the fight. You may be hurting in your leadership. You feel like you’ve been betrayed or stabbed in the back. This hurts. We can all admit this. This pain may be for a reason. You may learn how to prevent this pain in the future. Or you might use this pain to relate to those in the same kind of pain you’ve gone through. Don’t fight the pain. Look for the reason behind the pain. There was another assassin that made various appearances throughout John Wick. Her name was Ms. Perkins (Adrianne Palicki). She accepted instructions to try to kill John Wick while he was staying in the Continental Hotel. This was a major no-no as the hotel was a safe zone. At the end of John Wick, you see Winston bringing Ms. Perkins out and having multiple people shoot her. Her breaking the rules had consequences. Can I be honest? I often believe rules were created to be broken. I also believe rules were created to keep us safe. You have to be careful about the rules you break. Some rules have major consequences. Others have minor or no repercussions. Breaking the rules will have a consequence. You have to be willing to face the consequences of the rules you break. Question: Have you seen John Wick? If you have, what leadership lessons did you take away from the movie? 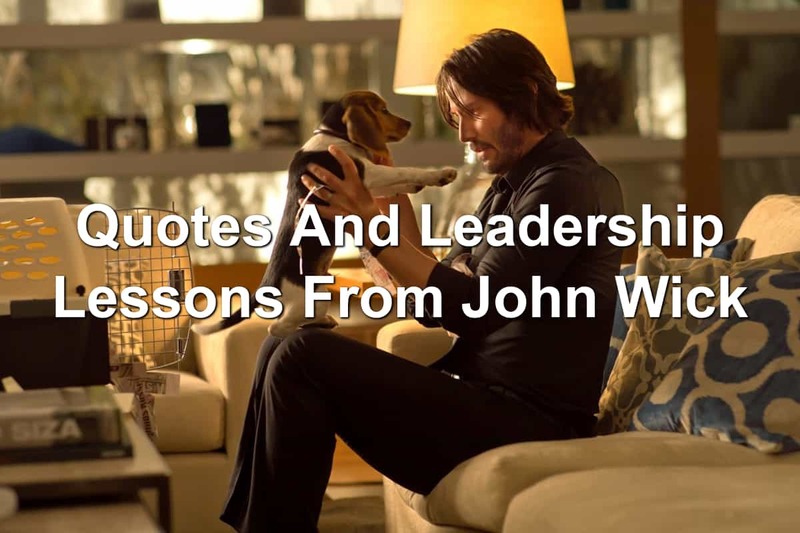 If you haven’t seen the movie, what leadership lessons from John Wick resonated the most with you? Share your thoughts in the comment section below.